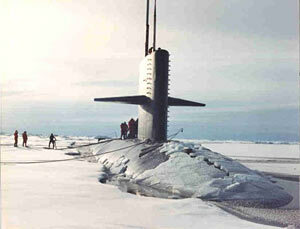 In 1993, The USS Pargo made the first civilian oceanographic submarine cruise in the Arctic Ocean. © Public domain. The first scientific trip to the Arctic by a nuclear-powered submarine is made by Pargo in the summer of 1993. During the cruise, underway data (bathymetry, gravity anomaly, temperature, salinity, ice draft, and images of the underside of the ice) are collected in the deep Arctic. The success of this program leads to the Scientific Ice Expeditions (or SCICEX) cruises continuing between 1995 and 1998 using the submarines Cavalla, Pogy, Archerfish, and Hawkbill. For 3 to 6 weeks, each of these cruises collect data within the central Arctic basins.